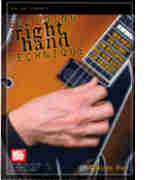 This book provides a master source for building agility, flexibility and speed while playing with a flatpick, as well as a repertoire source for the plectrum-style guitarist. The studies are designed to build reading ability and clarity of sound in a variety of styles, as well as agility in cross-picking and the playing of rapid linear passages. Includes over 100 original and jazz etudes, fiddle tunes, and a great number of classical guitar pieces transcribed for plectrum guitar. Written in standard notation and tablature.